Connecticut area beer bloggers wanted! Connecticut has a seriously underrated beer community and I intend on changing that. I'm working with the breweries, brewpubs, home brew shops, and eventually the states beer bars to bring them all together in an online community site, CTBeerTrail.net. The intent of the site is to shed some light on the state's best kept secret, its beer and the wonderful people that bring it to us. I want to enable Connecticut's craft beer producers, supporters and home brewers to educate the state's beer drinkers, and to inform beer travelers on where to go to get some great beer in the Constitution State. The site is still under initial development and beta testing, but don't let that stop you from checking it out and signing up. The goal is to get the site rolling for a gradual launch in February. I'll be adding more local CT beer business to our already growing list, and we'll be featuring in-depth articles on the people behind CT beer in the months to come. Eventually the site will be THE place to go for the latest in beer events in the state, and the best way to connect with craft beer professionals and fans within the state. 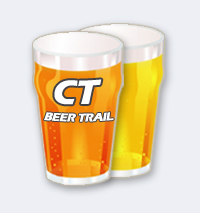 If you are a Connecticut area beer blogger and have any interest in having your content featured on the CTBeerTrail site, drop me a line. In the mean time, remember if your not making your own beer then at least buy and drink local beer. Very cool to see how the beer blogging world continues to spread. yeah.... I live in Stamford, and there is very little beer-related activity here. No homebrew shops, one (mediocre) chain brewpub. Apparently there used to be a brewery (Bank Street Brewery) downtown, but it closed. There is also this: http://www.unitedstatesbeverage.com/. Ohio is right on your heels Connecticut. But seriously were all in this together, so I hope all states get a stronger brewing community. I can't help you with Connecticut, but I've got Maine covered for homebrewing and Maine beers. Just started blogging seriously, so I don't have much content yet, but I'll get there. Maybe we should plan a New England Beer Bloggers' Meetup sometime!